https://www.w3.org/ — 5 June 2018 — Today W3C announces a significant update to W3C's internationally-recognized Web Content Accessibility Guidelines which addresses accessibility of web content, websites and web applications on desktops, laptops, tablets, and mobile devices. Web Content Accessibility Guidelines (WCAG) 2.1 expands upon guidance developed by W3C's Web Accessibility Initiative (WAI) over the years, and is used widely around the world to make web content more accessible to people with disabilities. WCAG 2.1 updates WCAG 2.0 and expands W3C's accessibility guidance, while maintaining W3C's standard of implementable, technology neutral, objectively testable and universally applicable accessibility guidance. All new provisions have been tested in implementations across different types of websites and web content. The Working Group has taken care to maintain backwards compatibility with the internationally-recognized WCAG 2.0, in that websites that conform to WCAG 2.1 will also conform to WCAG 2.0, which remains a W3C Recommendation. 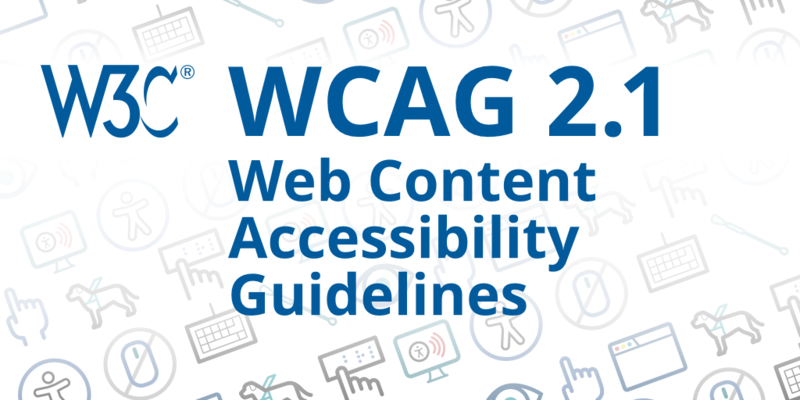 WCAG 2.1 is part of W3C WAI's stably evolving well regarded accessibility guidance, which also includes the Authoring Tool Accessibility Guidelines (ATAG) 2.0, and the User Agent Accessibility Guidelines (UAAG) 2.0. These guidelines, as well as an extensive library of supporting materials for WCAG 2.0 and WCAG 2.1 are available at www.w3.org/WAI/. The mission of the World Wide Web Consortium (W3C) is to lead the Web to its full potential by creating technical standards and guidelines to ensure that the Web remains open, accessible, and interoperable for everyone around the globe. W3C develops well known specifications such as HTML5, CSS, and the Open Web Platform as well as work on security and privacy, all created in the open and provided for free and under the unique W3C Patent Policy. For its work to make online videos more accessible with captions and subtitles, W3C received a 2016 Emmy Award. W3C's vision for "One Web" brings together thousands of dedicated technologists representing more than 400 Member organizations and dozens of industry sectors. W3C is jointly hosted by the MIT Computer Science and Artificial Intelligence Laboratory (MIT CSAIL) in the United States, the European Research Consortium for Informatics and Mathematics (ERCIM) headquartered in France, Keio University in Japan and Beihang University in China. For more information see https://www.w3.org/. The Access Board applauds progress made by the W3C Accessibility Guidelines Working Group in their release of the Web Content Accessibility Guidelines (WCAG) 2.1 Recommendation. The Working Group’s efforts to broaden the range of disability needs currently addressed by WCAG 2.0 will benefit many individuals who still encounter barriers to accessing the web. WCAG 2.1 is a vital set of guidelines for web accessibility that strongly supports innovative solutions for web and mobile applications. We are particularly happy with the addition of provisions for people with low vision and cognitive and learning disabilities. One of the tasks of the Accessibility Foundation is monitoring the accessibility of websites and mobile applications of public and private sector organizations. For them, WCAG 2.1 supports both innovation and European legislation and standards (EN 301-549). We will continue to support EOWG in the update and drafting of related documents and tools like the WCAG-EM report tool and accessibility statements. Adobe congratulates the World Wide Web Consortium on the release of WCAG 2.1 and is proud to be a contributor to this important and needed update to WCAG 2.0. This update offers improved support for people with disabilities and provides a clear signal from the W3C and W3C member companies that accessibility standards need to keep up with advances in technology. The crucial backward-compatibility of WCAG 2.1 will help ensure that accessibility standards can evolve to keep up with technology without sacrificing the standards harmonization that is so important to successful implementation of accessibility on a global scale. WCAG 2.1 will be part of Adobe’s development strategy moving forward to help us create solutions that benefit everyone. AMAC Accessibility is excited about the improved updates within WCAG 2.1. Unrestricted access to digital content for people with disabilities represents everything we at AMAC Accessibility strive toward, both for our customers with disabilities, along with our various shareholders and agencies we serve across the globe. WCAG 2.1 assists us in supporting and reinforcing that commitment. Also, as someone who is legally blind, and benefits directly from the improvements in WCAG 2.1 for people with low vision, I am personally grateful for the guidance and leadership of W3C-WAI in shepherding this important process, and bringing it to fruition in such short order. Benetech is excited that low-vision and cognitive disability success criteria have been added to the WCAG 2.1 specification. These additions offer opportunities for greater inclusion and better support for students with disabilities and learning differences. For us at Conexxus, convenience in the retail user experience is a key concern, promoting availability, understandability, and expedient location of services. Likewise, for the W3C, accessibility in the Web user experience is fundamental, promoting the ability of people with different backgrounds, talents, and capabilities to interact successfully with the World Wide Web. Accessibility makes using the Web convenient for everyone! Because it addresses evolving consumer demands for convenience in using mobile devices, Conexxus welcomes WCAG 2.1, and commends the on-going efforts of the W3C to make the web convenient for everyone. The W3C's Web Content Accessibility Guidelines have been one of the great success stories of the Open Web. The Web is accessible to people of various abilities due to the hard work of the W3C and WCAG 2.1 continues this important work. ConsenSys is pleased to support a fully accessible Web for all. Technologies constantly evolve and converge in the web. Therefore, the accessibility standards must also progress in parallel, so persons with disabilities are not left behind and can access all digital services on an equal basis with others as required by the UN CRPD. This was the objective of the advocacy campaign of the European disability movement towards the adoption of the 2016 EU Directive on the accessibility of websites and mobile apps of public sector bodies. We are proud to say that this will be the first legislation in the world that will be underpinned by WCAG 2.1 and that 80 million Europeans with disabilities will benefit from the most up-to-date web accessibility standards. The release of WCAG 2.1 is of great value to the 177 countries parties to the United Nations' Convention on the Rights of Persons with Disabilities seeking to implement its accessiblity provisions. Thanks to W3C’s effective consensus building processes among multiple stakeholders, the Web Content Accessiblity Guidelines are well recognized as the global standard for web accessiblity which most governments and user organizations refer to. Having them updated will greatly facilitate the work of governments, advocacy organizations and user organizations promoting accessiblity. WCAG 2.1, by incorporating recent technology innovation and global usage patterns will definitely further reinforce their universal adoption. With the launch of WCAG 2.1, web content will be more accessible to people with disabilities and the coverage is expanded to reflect the ever-growing use of mobile technology. Through a lot of hard work, the Working Group met an ambitious timeline to deliver on schedule in support of international updates, including the new EN 301-549 standards in Europe and updates to standards in China. Interactive Accessibility is proud to have contributed to a very important update to the W3C’s internationally-recognized Web Content Accessibility Guidelines. We welcome the release of WCAG 2.1, which will better support the creation of an inclusive digital world. This extension to the internationally-recognised WCAG 2.0 standard formalises what many have considered best practice for web accessibility. It will particularly benefit users with low vision and cognitive and learning disabilities, and mobile accessibility. It's encouraging that many of the organizations we work with are actively embracing the new extension. Knowbility welcomes the efforts of the W3C to update WCAG to improve web accessibility for all. We are pleased to see the new WCAG 2.1 success criteria extend access to areas of disability not covered before. We acknowledge the efforts of all contributors to research and develop these new success criteria. Mitsue-Links is pleased that the W3C has officially recommended WCAG 2.1. To date, we have proactively used WCAG 2.0 as a requisite quality standard so that everyone can use Mitsue-Links designed and developed websites/web applications. As both web users and access devices continue to diversify, going forward we will use WCAG 2.1. Furthermore, we expect that WCAG 2.1 will spread the notion that, in addition to those with disabilities and the elderly, ensuring accessibility positively contributes to all user experiences. The Network Information Center (NIC.br) congratulates W3C for the launch of the first update of the Web Content Accessibility Guidelines, WCAG 2.1. Accessibility on the Web is a very relevant topic in Brazil. Since 2016 a law has been passed requiring websites to follow good practices and international accessibility guidelines. NIC.br acts strongly in the dissemination of digital accessibility by promoting different activities such as courses, events, publications and translations of W3C content for the Brazilian market. WCAG 2.0 is the first authorized translation into Brazilian Portuguese and we intend to apply the same effort to make WCAG 2.1 available to the Brazilian public. WCAG 2.1 is an important step towards better accessibility for content on the modern web platform. The Paciello Group is pleased to have contributed to the new WCAG 2.1 Success Criteria, and to have incorporated them into our products and services so we are ready to help our clients around the world create even more inclusive user interfaces. As a government that strives to ensure that its websites and services are accessible to all users, including people with disabilities, we fully support the updates to the Web Content Accessibility Guidelines. We welcome the new Success Criteria as they will help make websites and mobile apps accessible to more people and will help designers and developers avoid common barriers that can prevent people from successfully using them. VitalSource, and all of our more than 25 million users, are excited about the release of WCAG 2.1. For more than a decade, our commitment to 'no compromise' accessibility has been welcomed by both our publishing partners, and the users of our platform. With its focus on mobile accessibility, WCAG 2.1 will provide improved benefits to the majority of our users who are on mobile platforms, and we look forward to releasing conformant updates later this year. The WCAG standards should be the cornerstone to any accessibility work. At Wiley, the WCAG standards are being built into the framework of our workflows and processes, so that content is born accessible. With WCAG 2.1, new standards help us create more versatile mobile content, as well as build improvements for users with low vision and cognitive disabilities. Here at Wiley we are extremely excited for the 2.1 release to further guide us in the journey to creating content and tools to help anyone—and everyone—learn and achieve their goals.